Article in the Coolum News, April 2016. The Sunshine Coast is home to all sorts of talented artisans as evidenced by the magnificent array of unique creations you can find wandering through the many weekend markets. But if, like me, you are creative and fancy a bit of bling - would you - could you - dare to make it yourself? 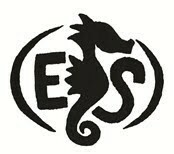 Well, when it comes to gold and silversmithing courses on the Sunshine Coast there can only be one - Eckart Schillings. 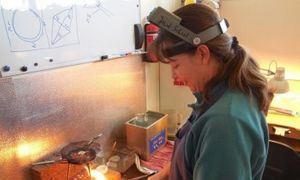 With over thirty years in the jewellery making trade, Eckart offers all kinds of tuition from his jewellery school at Peregian Beach Community House. 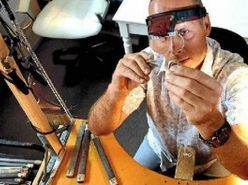 As a Master jeweller, Eckart is an expert tutor in silver and goldsmithing and his classes are always popular. Students who enrol in one of his courses are able to purchase a kit including tools and metals. If you have tried metalwork in high school then you will be familiar with the processes involved. Some of the processes include forming metal, annealing and soldering with an open flame torch, hallmarking, hammerwork, filing, sanding, and final polishing. Getting on with business at Eckart's workshop. Creating your own unique piece of jewellery is an exciting adventure as the concept is born from your thoughts and then translated into a three-dimensional object that you will always cherish. Learning to make your own silver rings and pendants with or without set gems is an experience you will savour. 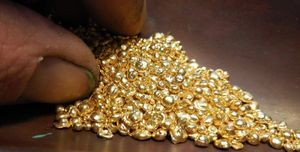 You will also gain a deeper appreciation for the work and effort that goes into making fine jewellery pieces. The workshop space at Peregian Beach Community House caters for small groups of 5-8 students per class and is equipped with individual workbenches, machines, and tools. Courses include small groups or private one-on-one tuition. In 2015 there are weekend silversmithing workshops for beginners; 4 week silver/goldsmithing courses for beginners and advanced; and advanced specialist courses (opal setting; enamelling, gemstone setting, and wax carving). 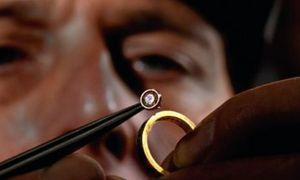 If you already possess advanced gold and silversmithing skills, Eckart also runs gemstone setting classes. 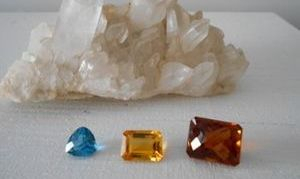 There you will learn how to set various gemstones. Who doesn't love a beautifully facetted gem? But what if you don't have any experience and want to take it one step further by making your own wedding rings? One day that's exactly what happened. One couple wanted to learn how to make their own wedding rings and voila! A new course was born. A couple can spend a whole day with Eckart learning how to shape the metal, form the rings, forge the metal, hallmark and polish. Your initial consultation will involve choosing ring shapes and metals (gold or platinum or other). Once the bars of metal are ready, the next stage is to roll out and forge the metal into the desired shape. The metal is then annealed (heated to soften it). The ring shapes are then formed and soldered to match your ring size. The rings are then worked on a steel mandrel to make them round. The rings are checked for size again and then hallmarked. The next step is to file, sand and finish the rings. You can choose to have a pattern hammered on or you can choose to have a smooth finish. The last stage in the ring making process is buffing for a perfect finish. If you choose a matt finish then you will see the colour of the metal without the brilliant shine. Setting of gems are an additional cost. The result, however, will be your own one-of-a-kind set of wedding rings. What a truly powerful statement about the love of two individual people. Making your own wedding rings will also remind you how important it is to constantly work at your marriage! It is the perfect way to start your married life together. It is also the perfect wedding present and symbol of love to give to your spouse. Click here to read a review about my Wedding Ring Making Experience for Couples.